I've got quite a few books lined up for my summer reading, and realize none of them really qualify as your typical light beach reads. I will need to fill in with a few of those, as some on my list look like they'll be heavy going. No reviews here; I haven't read them yet. But as I always like to see what people are reading, I thought you might feel the same. Our book club is currently reading A Beautiful Mind by Sylvia Nasar. Because I won't be at the next meeting, I decided to take a pass and spend the time reading one of my favorite authors, Wendell Berry. I love his books set in the fictional town of Port William, Kentucky. One of my favorites is Hannah Coulter. But right now I'm reading a book of his agrarian essays entitled The Art of the Commonplace. In it, he laments the passing of the small family farm and shares a vision of what real community can look like. He offers an alternative to the mass consumption, stressed-out urban culture of today. Here is a poem of his I've always liked. Isn't that beautiful? I don't have a similar place to go and lie down, but I can imagine . . . In our book club, if a book you recommend gets enough votes, and we decide to read it, you are in charge of leading the discussion. Two other books I recommended will be coming up later this year, The Silmarillion by J.R.R. Tolkien, and The Idiot by Fyodor Dostoevsky. So I want to get started on those. The Silmarillion is the story of the events that occur in Middle Earth prior to The Hobbit and The Lord of the Rings. I've already read the chapter entitled Of Beren and Luthien because I read that those are the names engraved under Tolkien's and his wife's gravestone inscriptions. It's quite romantic, and a little unusual in Tolkien's writings as he doesn't have much romance in his books (although you could say his whole genre is certainly romantic in the broader sense of the term). I chose The Idiot partly because I love Dostoevsky. One of my all-time favorite books is his The Brothers Karamovoz. But mostly I chose it because it contains the famous line "beauty will save the world." Can't wait to read that in context. I would like to write another book, this one on the importance of beauty in our lives, entitled simply The Beautiful Matters, or Why the Beautiful Matters. I have a small stack of books to read on that subject. I've been perusing them, but I'm thinking perhaps I should just write without being influenced too much by what others have to say on the subject. 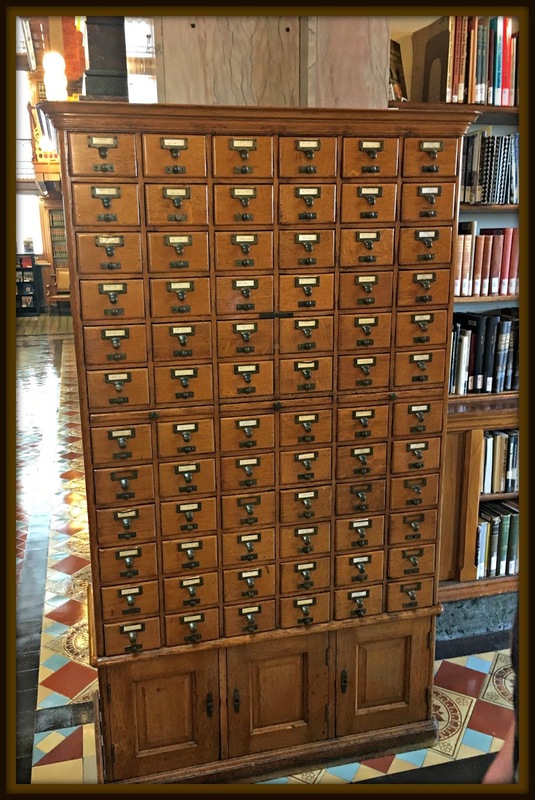 This lovely old card catalog is in the library at the state capitol in Des Moines, Iowa. I would love to have this in my home. My mom read and then passed on to me the whole Jalna series by Mazo de la Roche. This is the multi-generational story of a family who settled on the early Canadian frontier. I've read three out of the ten books that she had (I think there's a couple more to the complete series), but I'm already a little tired of them. Kind of in the same way I got tired of Poldark and Downton Abbey (not the books, the TV series). Just ongoing soap operas. When I feel worried or anxious or in need of comfort, I turn to my stack of Grace Livingston Hill for some light and soothing old-fashioned story telling. I've read through the sixty or so books I have of hers and just finished the fourth in my second go-round. Other comforting and well-loved books that I turn to include any by Elizabeth Goudge and, for lighter reading, Miss Read. I have to keep up with the book club reading also. We move at a pretty fast clip; a new book every two weeks. I'm not a particularly fast reader; I tend to savor every word and stop and think about what I'm reading or look things up as I read. So I'm usually up late reading the night before book club, trying to get my "homework" done! What are you all reading this summer? Anything good? Hi, I'm just popping over from Mountain Top Spice to visit your blog. I love the Wendell Berry poem and just now sent it on to two of my sons who I know will also enjoy it. Hannah Coulter was my favourite of WB's books. One of these winters I'll reread it. Right now I'm reading Elizabeth's German Garden, a book one of my boys gave me for Mothers Day. It's a very old copy, published in 1900. Maybe we discovered before that we both love Wendell Berry, I can't remember. I know there are two other blog friends who do so that makes 4 of us! I got hooked on him after reading through a book co-written back in the 30s by some of the Vanderbilt U agrarians called I'll Take My Stand. My father was a huge supporter of small family farms and felt convinced that their passing would be the downfall of our country. And I read The Idiot when I was 18 and obsessed with Russian literature. I wonder if I would read it today as I go for gentle books now? I tried the Jalna series too when I was younger and also lost interest at some point. Any friend of Goudge is BFF to me! I reread 3 of hers this spring and then got on a time of rereading all my Beverley Nichols books, now I'm back rereading all my Isabel Dalhousie mystery books as well as reading any new food memoir book I come across. And so it goes, the wonderful world of reading and isn't it grand? By the way, I read yours too and loved it, thought it was intelligent and practical as all get out! What a lovely read I've had. Thank you for sharing a peek into your reading world. Love the Wendell Berry poem. Like you I don't have a place like he describes but I can imagine it and feel the same peace. I like the Brothers Karamovoz too, and I love the line you mention from The Idiot. I hope the book turns out to be another favourite for you. PS. I forgot to wish you the very best as you undertake your newest writing venture. You will be very good at exploring the topic of The Beautiful Matters. I look forward to reading it one day. Well, I'm more like you too, studying while reading and really absorbing it. It would not be fun for me to have to read a book every 2 weeks... That's too much of a MUST do or else you look bad and feel guilty. I'm still scanning, now an old map with conference photos and such from Pieter. It takes a lot more time than just text as I want to scan in a higher resolution for quality purpose. But I'm still positive that by Wednesday when I see my orthopedic surgeon that I'm through. Hope I get the green light for picking up life as I knew it before March 27. Patience has been hard to practice but I feel at least like yielding something! PS and finally I will be back to more reading; we have tons of books and I LOVE to read! I always like to hear what you're reading, Deborah. I finished reading The Way of Trust and Love, and Searching For and Maintaining Peace, both by Jacques Philippe. Now I'm reading Hallelujah Anyway, by Anne Lamott. I guess I'm on a spiritual journey. Happy reading this summer, my friend! I've started keeping a list of what blogging friends are reading. I've found some great books that way. I love that poem by Wendell Berry, but I have not read anything else by him. Another author to add to my list. I enjoy reading Rosamunde Pilcher's books when I'm stressed and need something easy on the mind. They are full of homey descriptions of houses and gardens, and mostly lovely people. I recently re-read Farther Afield by Miss Read and found it just as charming as when I read it first. My most recent finish is Daughters-in-law by Joanna Trollope, another easy read. I would also love to have a vintage library catalogue in my home! I'm currently reading "Everybody Write" in an attempt to improve my social media game for work! Oh I love that card catalog too!!! I could think of a lot of uses for that:) I need to find some new books to read...going to the beach soon! I have always loved to read and am so thankful I still enjoy it. That's a lot of reading! I loved Tolkien's Silmarillion, which I read last year. It had been many years, and of course I'd forgotten it all :) I think they're making a movie of the Beren and Luthien section. Not sure when it will come out. Enjoy your books! You've read a lot of authors that I'm not familiar with so I need to look at them on Goodreads. I got my journal out this morning to work on updating my reading list. I just discovered an old mystery series by Deborah Crombie and I am LOVING these books....light reading and FUN! And set in Egypt! Happy summer reading! The book group I started a long time ago read The Idiot together. I think I read it before I even finished The Brothers K. -- You certainly have a good reading list to keep you happily reading this summer! Oh my, isn't that card catlog lovely! Wow you read a lot of books. That is so wonderful and it must be nice but a lot of work to keep up with you book club. I just got done reading Pachinco and I enjoyed it. I also The Joy Luck Club. It's so nice to relax in the summer and read books. I too love staying up late at night to read if I can't sleep. I will have to check out some of those books on your list. Enjoy the summer reading.